The importance of the canals to industrialization cannot be doubted, but the demands for flexibility in transportation, and the richness of the coal seams fueled the rapid growth of the railways, with Bolton's first line preceeding the Liverpool to Manchester line by two years. A number of major manufacturers in Bolton, William Hulton, Benjamin Hick and Peter Rothwell formed a company called the Bolton and Leigh Railway. While the rest of the country was still building their network in the 1840's, Bolton's was virtually complete. 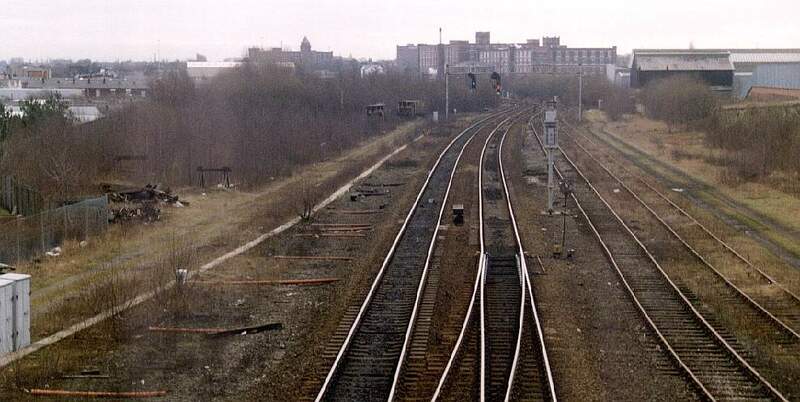 Prior to the rail network, 290 million yards of cloth were exported from Lancashire, rising to over 2000 million yards after completion of the railways in 1860, and by 1914 6600 million yards had been exported. The railways were far more important than just for goods transport, passengers were important too, and the local wakes weeks are famous for overflowing trains filled with holidaymakers heading for the Lancashire coast. Plans for the rail network started as early as 1822, partly to break the monopoly of the canal owners, but the transport provided by the Bolton and Bury canal was insufficient to cope with Bolton's demands for transport. The Bolton to Leigh railway started at Great Lever in Bolton, near to the Bolton Bury Manchester canal and terminating in Leigh near the Leeds Liverpool canal. George Stephenson carried out the survey. The 7.5 miles of freight railway opened on August 1st 1828. The first locomotive on the line was called The Lancashire Witch an 0-4-0 locomotive, which pulled wagons up a 1 in 33 gradient up Daubhill. By June 13th 1831, this line started to carry passengers as well. 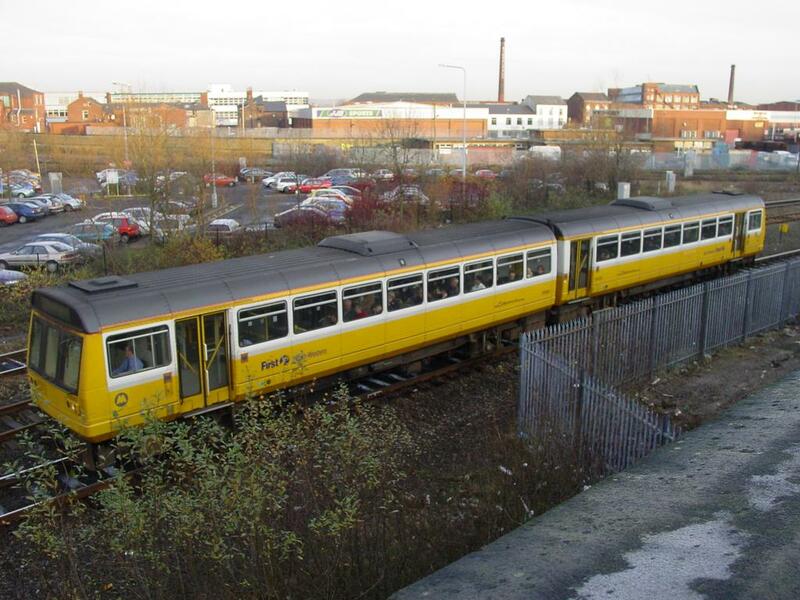 Carriages ran between Liverpool and Bolton, together with Kenyon Junction, permitted businessmen to travel easily between Manchester, Liverpool and Bolton. Stations opened at Bolton, Daubhill, Chequerbent, Atherton, West Leigh and Pennington. Colliery subsidence had some effect in changing the gradients the locomotives had to cope with. Cotton manufacturers: John Mawdsley, Thomas Holmes, William Morris. Spinners: Thomas Bolling, Edward Bolling, William Bolling. Bleachers: Richard Ainsworth, Peter Ainsworth, George Blair. Calico printers: H.Duckworth. Reed makers: William Pratt, Richard Taylor. Vitriol and Bleaching power manufacturer: John Rainforth. Iron founders: Joseph Cole, Isaac Dobson, Benjamin Dobson, Benjamin Hick, James Hilton, Peter Rothwell, William Swift, Thomas Thompson. Colliery owners: William Hulton, John Booth. Brewer: Matthew Carr Dawes. Gasworks engineer and manager: Ralph Spooner. Merchants: Will Bowker, Will Tickle, James Tickle. Linen draper: Johnson Lomax. Slate and Timber Merchants: James Gray. Chemist: James Scowcroft. At Horwich were the world famous Loco Works, building rolling stock for Bolton, the rest of Great Britain and the rest of the world. Work commenced in 1889, with Lancashire and Yorkshire Railway 2-4-2 Tank locomotive no 108. One of the very last was British Railways Standard Class 4 2-6-0 No. 76089, allocated to TRafford Park (9E) from May 1957 to December 1961, and transferred to Bangor, but withdrawn in 1966. The last ever steam locomotive built was Class 4 2-6-0 No. 76099, completed on November 28th 1957, and allocated to Corkerhill in Glasgow. The works continued with the formation of British Rail Workshops Division in 1963, when it was designated a Wagon Repair Works, overhauling Electric Multiple Units, Wagons and Service Vehicles. The main railway station in the town centre is Trinity Street, in Trinity St. 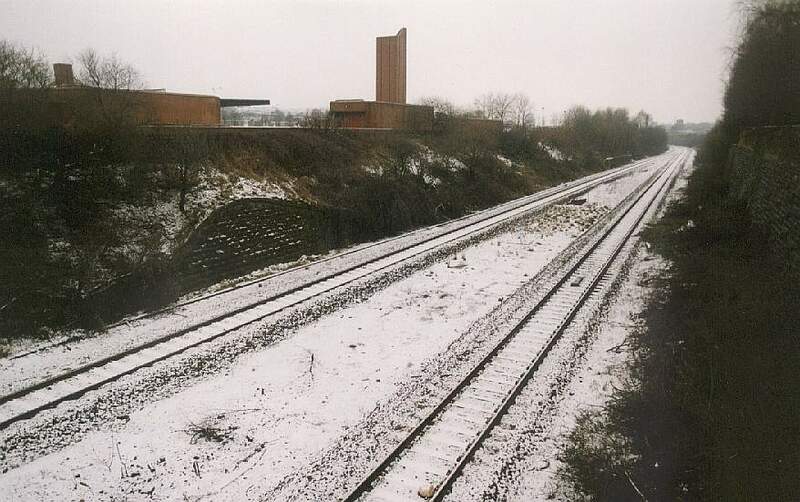 In 1987 it moved from the southern side to the northern side of the street during the refurbishment of the station, and its incorporation with the Newport Street bus-rail interchange. Passenger train leaving Trinity Street for the coast. This takes you on the southern branch to Westhoughton and on to Wigan Wallgate. The northern branch goes to Middlebrook and Blackrod to Chorley. The origin of this picture is unknown, but of interest to be included, it is believed to be of the local area, but the exact location unknown. Loco 44689. If anyone can help please send an email. Ive had two email suggesting the same place. 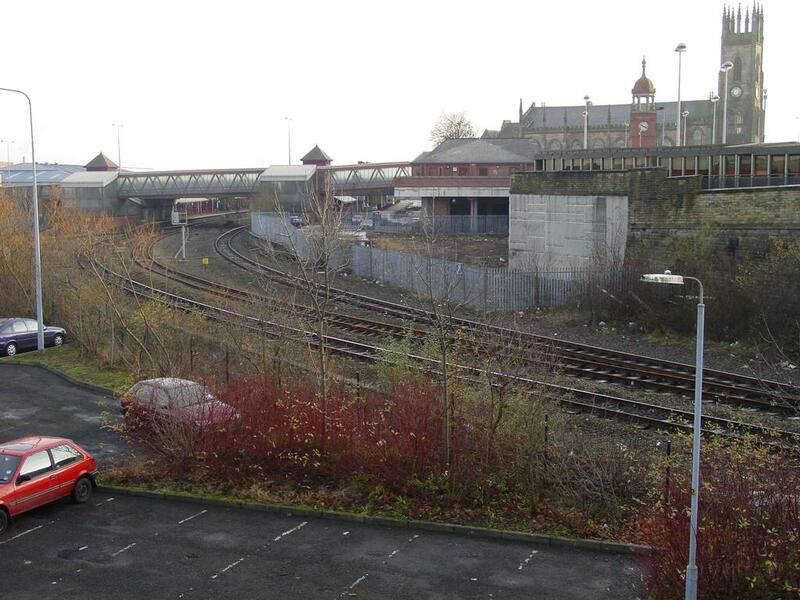 Alan Darbyshire writes to say: I think the lorry hanging over the wall is the old st lukes railway station going into southport, it was in between the present day meols cop and southport station. the wall is exactly the same and the row of shops opposite still stand and the large building behind is a pub ships anchor or blue anchor. 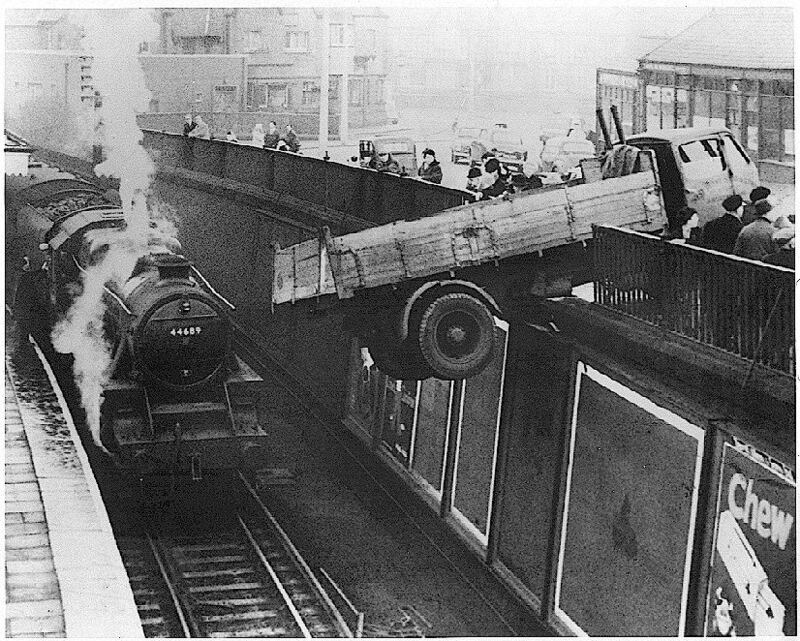 Philip Hilton writes: If your still looking for the location of that lorry accident on your site it's at StLukes station on the up line to Southport, note the third rail for local electric services. A mate of mines dad who worked on the railway remembered it happening although when it was I'm not sure. This email written by Dave McIntosh. I am a historian, who has lived in the area of your photograph since aged 2. 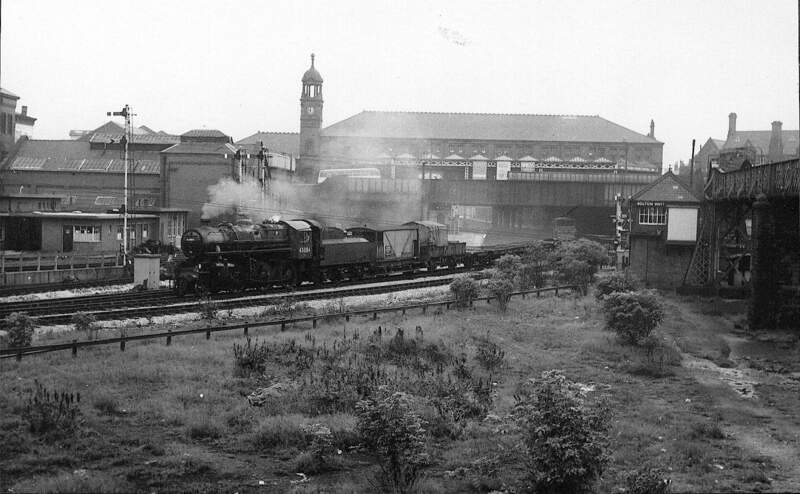 I can tell you that building in the far left of the photograph is that of the Blue Anchor pub (which still stands), on the Railway bridge of St Luck's road. I have no info on the lorry accident over train line so happy hunting. The site of this accident is St Lukes, Southport. Preston lines inbound to Southport.